How to toggle between "Search Major Fields" and "Search All Fields" in 1Password main app? 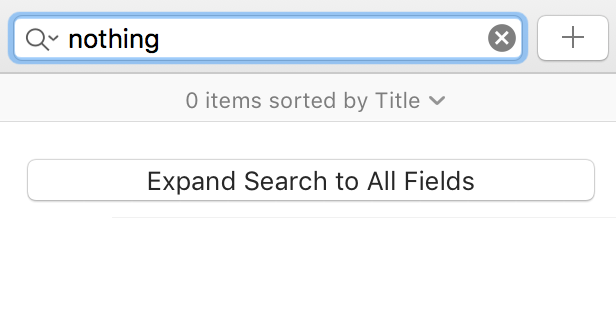 By default, 1Password searches for text in the major fields only, and this can be changed with a button "Expand Search to All Fields" which shows up when a certain search term generates no results. Alternatively, this setting can be changed in the 1Password mini's gear icon as shown below. However, there doesn't seem to be a place where users could change this in the main app. I went through every tab in the preference page and the entire toolbar but couldn't find it anywhere. This means that for someone who doesn't know about the aforementioned 1Password Mini option, they will be unable to go back to "Search Major Fields" after changing to "Search All Fields." I believe this is an UI oversight, please correct me if I'm wrong. Thank you 1Password team. @vicjang ... Click the little down arrow to the right of the magnifying glass. It's in there. @OAW Oh wow! Thanks! I gotta say it's pretty hard to notice haha. Glad @OAW was able to assist here. If we can be of further assistance, please don't hesitate to contact us.